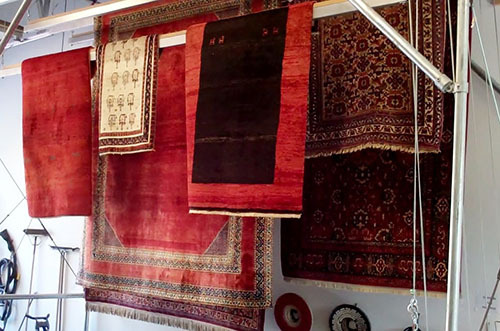 For anyone owning oriental rugs, knowing how to properly care for it is an essential aspect towards ensuring the beauty and value of fine rugs for years to come . There are many potential problems that might pop up over the course of a rug’s life, but with proper care and timely maintenance, an oriental rug has the ability to last forever. For significant stains or when years of accumulated soiling exist, an at-home rug cleaning may prove ineffective. It then behooves the owner to contact an oriental rug cleaning service. The oriental rug cleaning professional will have the expertise, knowledge and equipment that’s necessary to restore your area rugs. Oriental rug cleaning and washing practices take years and years to master so be careful to use due diligence in choosing a company. However, for the general spotting and minor soiling, a step by step maintenance program at home may prolong the need to hire an oriental rug cleaning expert. For starters, it is necessary for anyone with an oriental rug to clean up a stain immediately. The longer a spill has to set and dry, the more difficult it proves to remove and the high possibility of becoming a permanent stain. Due to this, regardless of what the material is or what the stain is from, as soon as it occurs, attending to it right away makes it that much easier to clean up. Allowing a stain to set might permanently damage the rug, even with the assistance of professional oriental rug cleaning companies. Due to this, proper rug maintenance is a crucial equation in promoting successful results when you find yourself in the need of a professional oriental rug cleaning company. Even if the rug looks clean, chances are it is not, so regularly attending to it increases the ability to extend the life of your beautiful oriental rug. It is important for the rug to be vacuumed on both sides. Removing the dirt, dust, and loose grime is necessary, which is why vacuuming both sides is required. Flip your rug upside down and vacuum the back side of the area rug with the beater bar of your vacuum cleaner set on the lowest setting. This will loosen and dislodge insolubles deep in your rug’s foundation, allowing you to then flip the rug over and achieve superior vacuuming results. Oh yes! Please remember to raise the beater bar before vacuuming the top side of the rug. Never use a beater bar on the top side of a silk rug. There are many carpet cleaning solutions out there. However, these solutions are made for carpeting fibers which are synthetic. Wool fibers can be destroyed using carpet cleaning solutions, dyes can bleed and fibers can become distorted or bleached. DO NOT use carpet spotters. Due to this, someone who owns an oriental rug needs to use a milder, yet effective cleaning solution. This is done through the combination of cold water and white vinegar. By combining three parts water and one part vinegar, it is going to reduce the PH of your spotting solution and therefore reducing chances of damaging your Oriental rug. Remember to ALWAYS test the rug for colorfast before proceeding. Compress a white cotton towel saturated, but not dripping, with the vinegar solution over the area to be cleaned for one minute. If you have dye transfer STOP and call a professional, otherwise proceed. I recommend placing a dry towel beneath the rug where you’re working, this will protect the flooring below. Now with your saturated towel you can blot the area NEVER scrubbing because that can permanently distort the fibers. Agitation can be achieved by wiping the towel In the same direction the fibers lay. If you’re not successful call an oriental rug cleaning professional before the spot becomes a permanent stain. For anyone who owns an oriental rug, general maintenance such as mild spot removal and regular vacuuming Is only one factor In preserving value and beauty. The most Important component Is knowing when to call the professional. We are fine rug cleaning professionals. Give us a call today 360-627-9290!